2 and 4 Post Rotary Lifts | Reliable Hydraulics Inc. When you need quality lifts for your auto shop, choose Reliable Hydraulics Inc. We offer a wide selection of lifts for mechanics such as 2-post lifts, 4-post lifts, symmetrical, and asymmetrical lifts. We’ll keep your shop running efficiently. Our 2-post Rotary lifts can handle 15,000 up to 18,000 pounds and come in options like extended-height and low-ceiling models. Stackable adapters make contact with the vehicle fast and easy and you can feel safe knowing that the locking system will engage every 4 inches. 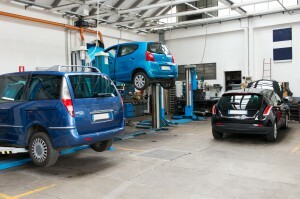 When you work on a variety of different vehicles, you need a Rotary lift you can depend on. This is why we offer a variety of 4-post Rotary lifts. 4-post models can handle anywhere from 18,000 up to 60,000 pounds. The lifts are operated on DC battery power, making it so that the lift can still be lowered in the event of a power outage. We love to provide you with options, which is why we offer both symmetrical and asymmetrical Rotary lifts. With symmetrical lifts, the vehicle is centered front to rear in the bay. This type of lift is perfect for trucks, vans, and commercial cars. Our asymmetrical lifts center the vehicle to the rear of the columns. This lift is ideal for cars and light trucks. Have questions? Contact us today to learn more about our Rotary lifts! This entry was posted in Auto Lifts on April 15, 2015 .